While it’s safe to assume the Black Hood is back in the forefront of everyone’s mind, we are still no closer to figuring out the person – perhaps the even persons – behind the mask. 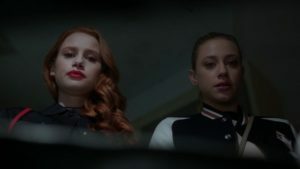 Betty seems possessed by the notion that the Black Hood is actually her father and turns to an unlikely friend for help: Cheryl. Given Cheryl’s father was a murderer (remember, he killed her brother Jason), it’s a safe bet that Betty thought her cousin wouldn’t dismiss her initial ideas and she was correct. Cheryl offers both advice and support for Betty’s endeavor and actually becomes her new partner in crime solving. After a few minor break-ins, Betty finds some circumstantial evidence but no smoking gun. Things line up from her father’s date planner but it’s not specific enough. Betty is quickly becoming overwhelmed with the secret keeping and following Cheryl’s advice, Betty confesses to her parents about the phone calls from the Black Hood and turning Chic over to him. A surprising confession from her father, Hal, about also feeling the darkness convinces Betty it’s him but something that puts a wrench in her suspicions. 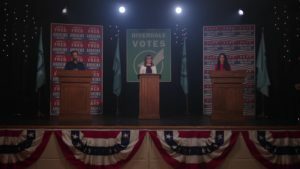 During the mayoral debate, someone dressed as the Black Hood opened fire on candidates, Hermione Lodge and Fred Andrews while Hal was sitting in the crowd. I suppose that wasn’t enough to deter Betty because she later called her dad and asked him to meet her at the Town Hall to finish their earlier conversation where she accused him of being the Black Hood in not so many words. The only problem is that Hal never showed to see the evidence laid out by Betty. However, Cheryl got a late night visitor in the form of the Black Hood. The blindfold might finally be coming off of Archie’s eyes when it comes to Hiram Lodge. Our beloved Archie is out campaigning for his father and going door to door but it serves the dual purpose of searching for the person with the Black Hood’s eyes which Archie remembers so clearly. Hiram calls Archie in for a conversation about why Archie is campaigning for his father when he supports the prison and also asks if Archie still wants to “makes his bones” with him. 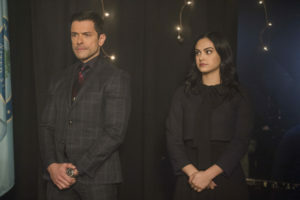 Archie insists he’s still on board with Hiram and explains about searching for the eyes. Hiram suggests Archie get the Black Circle (wasn’t it red before?) back together to help patrol now that the threat of the Black Hood is back. Archie agrees but doesn’t realize the monster he’s unleashed. Why? Because Moose found out Midge was cheating on him with a Serpent before she died and now we are back to war between the Northside kids, mainly the newly reformed Black Circle and the Serpents. The Serpent in question was Fangs Fogarty and this guy is scared for his life, although he didn’t actually do anything wrong. Due to the new sheriff, (brought in by Hiram Lodge) being extremely thorough, Jughead’s behind the scenes footage of Fangs with Midge makes Fangs suspect number one. A messy arrest with a switchblade at school causes the whole town to turn on Fangs and the Serpents by default. 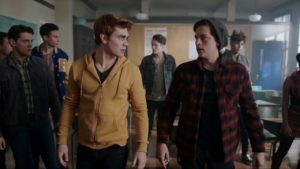 Jughead calls in Archie to get the Black Circle to lay off the Serpents, which includes vandalism at their favorite watering hole and stirring up trouble while Archie confronts the rest of the guys and tells them to back off because vandalism isn’t what they do. Sadly, Reggie steps up and says the Black Circle is essentially his, Hiram told him so and Hiram is the one paying them to do what they do. Hiram was the one who suggested they go have some fun and vandalize. Consider the wool officially ripped off Archie’s eyes! …and Archie’s hand is on the gun. Due to Veronica’s ransom of Nick St. Clair last week, she’s attracted the eye of other mob boss sons. They aren’t there to court her romantically but to propose ideas on how their families could work together. The only idea that intrigues her is the suggestion of a moderately sized casino in Sweetwater. After being assured the casinos run above board, she takes the idea to her father who immediately dismisses it, for various reasons. Taking some initiative, she sits down with former Mayor McCoy (who is also busy representing Fangs) to discuss ways to make a casino legal and above board. Once again Veronica takes the idea to her father and once again, he shoots it down with more gusto than necessary. We now see Veronica with her mother post-Black Hood shooting at Town Hall and it’s clear to Veronica that her mother is not taking this well. She insists her mother step down for her own safety but, once again, Hiram steps in and says no. Veronica issues a plea to her mother which, seems to fall on deaf ears and is followed by a demand for respect from her father. This is Veronica’s breaking point given that her mother was shot at yet Hiram is still inclined to put her safety at risk. Veronica storms off and shows up at Archie’s place, pledging support for Fred, as she can no longer in good conscience support her family. Fred came home to a note posted on the front door saying he was next. He had the choice to cancel the mayoral debate but didn’t back down and a deputy was posted at the door for safety so Archie wouldn’t have to linger with a baseball bat. It didn’t really stop Archie from doing it but there might have been a little less fervor. Betty and her mother are back at The Register helping out Hal but Betty was really there to snoop. A call came into The Register from the local coroner about a found dead body of a young man in his 20s. Betty went with Cheryl to check and it wasn’t Chic but the whole experience hit her pretty hard. Archie had a bit of a moment with his father Fred and explained why he’s been supporting and working with Hiram after the initial shooting. I think Fred knew all along but it was nice that Archie had an honest moment about everything. It looks like that father/son bond is coming back strong. Joaquin is back. If you forgot who he was, he’s the Serpent who broke Kevin’s heart and was involved with the disposal of Jason Blossom. He’s returned to help Fangs vanish since Riverdale is no longer safe for him. Cheryl isn’t really dismissive about Hal being the Black Hood but she does mention that he wasn’t the stealthiest guy when he was sneaking around and sleeping with her mother. In a very nasty move, Hermione brought up the Black Circle gang during the debate. It’s a nasty move because Hiram is the one who insisted Archie reform the group, and then they turned around and called it dangerous. The new sheriff is pre-disposed to old beliefs, thanks to Hiram. This means Archie and the Black Circle are good while Jughead and the Serpents are muckrakers. Awesome. There are whispers of the Ghoulies getting out of jail and being out for blood. Uh oh.